Unearthing social and historical gems from six local museum collections and archives across Scotland, Sydney based artist Kate Scardifield explores and reframes Scottish and Australian connections in a new exhibition at the Scott Gallery, Hawick Museum from 23 March to 18 May 2018. Presenting and creating art in a new context, Ley Lines takes the work of Scottish Astronomer and Governor of New South Wales Thomas Brisbane as a starting point. Brisbane was one of the first to map the constellations of the southern hemisphere and in Ley Lines Kate Scardifield creates and connects new constellations. 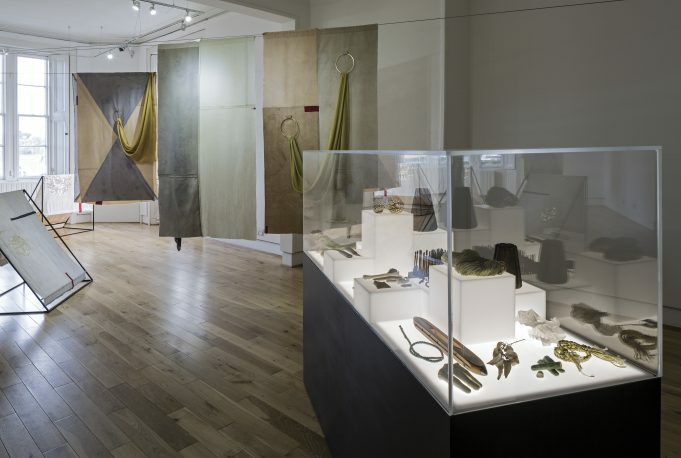 These new works include textiles, sculpture and video, made in response to Brisbane’s collected astronomical equipment and selected objects and fragments held within local collections in the Scottish Borders. Exploring their parallel histories, Ley Lines links aspects of Scotland’s unique heritage, across regional locations, connected to such colonial mapping and territory marking. For each touring location, historic material is exchanged and arranged as new and distinct local constellations around Scardifield’s commissioned works. *Hawick Museum have a major opening event on the evening of 28 March for the start of their season, with 3 exhibitions to view on the night, including Ley Lines. CABN Leader Mary Morrison was selected to be part of a Creative Scotland supported research trip to Australia in 2014, and met Kate Scardifield in her studio at Artspace, Sydney. Mary has worked with Panel and the other partners, as well as colleagues in Live Borders Museums, Galleries & Archives, to develop the project and secure funding from Creative Scotland to realise a residency period in 2016, and to support the touring exhibition – which launched in St Andrews in December 2017. In June/July 2016, the partners hosted Kate Scardifield in five locations in Scotland: Glasgow, West Kilbride, Scottish Borders, Falkirk and Fife. Ley Lines is informed by this residency period, and combines original artworks by Kate, alongside objects from Scottish collections, changing to reflect the locations where the exhibition is hosted. CABN was delighted to host Kate during her residency week in the Borders, where she researched Live Borders Museums and Archives collections, and the textile archives at Heriot Watt University, School of Textiles & Design. Kate also delivered a public talk during her residency, and met a number of local artists and makers. The post Ley Lines | An exhibition by Australian Artist Kate Scardifield appeared first on Creative Arts Business Network.